Named in honor of a former Administrative Assistant at Stong, this bursary provides for financial aid to full-time Stong students who have completed at least one full academic term, and demonstrated a high level of commitment and involvement in the college, a serious academic attitude (minimum CGPA of 7.0) and financial need. The bursary is advertised early in the school year, and normally awarded in October following an interview process. The bursary provides for Canadian Citizens or landed immigrants. Applicants will be required to demonstrate financial need on a Student Financial Profile application form, and a one-page letter that describes their involvement in Stong College. The scholarship is awarded to a full-time student enrolled in either the History of Arts/Visual Arts programmes or the Performing Arts in the Faculty of Fine Arts on the basis of academic and/or artistic merit. The scholarship committee and the Board of Adjudicators reserve the right not to make an award in any given year. 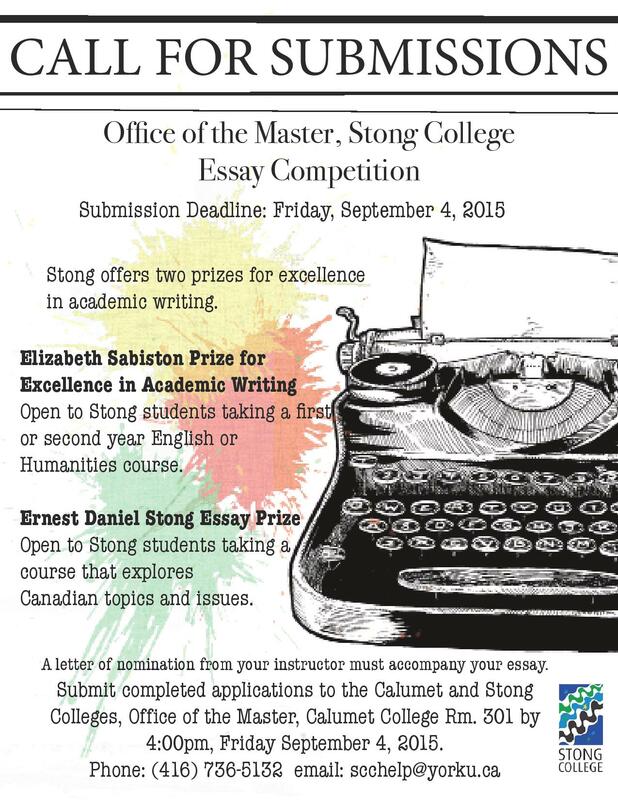 For further information please contact the Office of The Master at Stong College. This scholarship can only be applied toward tuition fees. The decision is made by a committee who evaluates the portfolio in the Spring and the award is given once registration is confirmed. Awarded to three undergraduate continuing students who exhibit leadership qualities, have contributed significantly to student life at Stong College, and have achieved a minimum grade point average of 8.0(A).Recipients must be Canadian citizen, permanent resident or protected persons, residents of Ontario and demonstrate financial need. Applicants will be required to demonstrate financial need on a Student Financial Profile application form. Members of the Stong community - students, administrators, faculty and alumni - established this scholarship in 1982. It is awarded to a returning full-time Stong student with the highest cumulative grade point average. The entire Stong College community funds the Virginia Rock Award, named in honour of the first Master of Stong College. The successful candidates must be full-time students, will have earned a minimum 8.0 grade average, will have been an active contributor to the College, and will have financial need. The award is thus intended to recognize a distinctive combination of academic achievement and devotion to Stong College and its ideals. The award is advertised early in the school year, and normally awarded in October following an interview process. Applicants must be Canadian Citizens or landed immigrants. Applicants will be required to demonstrate financial need on a bursary application form (SFP)and submit a one page letter detailing their involvement in the College community. The committee reserves the right not to give the awards in a given year. The Master of Stong College presents this award to students who have maintained an outstanding academic record throughout their undergraduate years at York. It is award to students in their graduating year with a cumulative GPA of 8.0 and above. Named in honour of Allen C. Koretsky, who served as the Master of Stong College from 1988 to 1993, a book prize will be awarded to a Stong College student for an outstanding essay in a course in Medieval or Renaissance English Literature in the Faculty of Liberal Arts and Professional Studies. It is preferred that the prize takes the form of a significant or substantial book, and if there is a balance, the amount should be in the form of a gift certificate to be tendered at the York University bookstore. The essay must be the unrevised version that was originally submitted for evaluation but without professorial comments. Given in honour of Pressor Elizabeth Sabiston, for many years the Academic Advisor of Stong College, this prize is awarded annually to a Stong College student whose achievements in academic writing in a first or second year English course is deemed to be of outstanding quality. A nominating letter must accompany selected writing from the Course Director, forwarded to the Master’s Office by May 31st. This award was established in memory of Ernest Daniel Stong, a patriarch of the Stong family. An annual award will be presented to a Stong student taking an English course, whose essay on a Canadian topic is selected as the most outstanding. Submissions must be made by the Course Director and forwarded to the Master’s Office by May 31. This award was established by Gerrard Sendrey of Bordeaux, France, a renowned graphic artist. It is given to a student who has had his/her art showcased at the Zacks Gallery Stong Student Showing.